Cells are highly compartmentalized into numerous membrane-bound organelles. 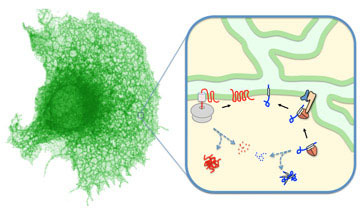 The membranes that define each organelle contain unique sets of embedded proteins that impart distinct functionalities to that organelle. How are all these different proteins selectively targeted to their correct destinations? And once they get there, how are membrane proteins inserted, folded, and assembled properly into the lipid bilayer? Defining the various pathways for membrane protein biosynthesis and understanding this machinery in molecular detail are major goals for our group. Despite sophisticated biosynthetic pathways, sometimes things go wrong. What does the cell do when protein sorting, insertion, or folding fails? We are finding that failure is surprisingly common, and that the biosynthetic machinery is intricately linked to degradation pathways to help eliminate such mistakes. The importance of scrupulous quality control is dramatically illustrated by the consequences that result from its failure: protein aggregation, cellular dysfunction, and disease. We anticipate that our mechanistic studies of biosynthetic and quality control pathways will shed light on both a fundamental cell biological problem and the molecular basis of various diseases. Structure of the Sec61 channel opened by a signal sequence.